Covet; that’s a great word. I covet an X-box. All the Joneses have them. Many families who aren’t rich or well off have them. If you have teenagers you probably have one. But I’m an old mature woman and I want one so much covet would better express it. When I see ads for them, I lose myself imagining dancing and jumping. I’m like a little kid staring at the photo, touching it as if it will materialize in front of me. I enter Ellen’s 12 Days of Christmas Giveaways regularly in hopes of a miracle. I can imagine the little device in my hand with my thumbs going but I can’t imagine what games I’d be playing ….. its a whole new unexplored world! First I would get the device and unwrap it. I would pull out a brick of Styrofoam and be mad that now I have Styrofoam to deal with. (When are they going to recycle that crap?) I would pull out my receiver and try to figure out where the wires all went. Then I would discover I didn’t have the right wires….. I need a special gold covered multi wire that I can only get in Sarnia or London, an hours drive. The next day, after returning from Sarnia, I would try and figure out the wiring. I would spent the rest of the day yelling out stuff like “What the f__k!” “Mother__ker!” “sonofabiiiitch!”and a lot of other foul expletives that seem to relieve the frustration. Finally I would get it all together, put everything back in place and turn it on. The TV would say ‘no signal’. Repeat this over and over. I know this because my ex-husband bought me a receiver to go along with my new HD TV my family bought me for my 60th birthday. I tried 3 sessions of swearing, tears and frustration before I gave up completely. It sat for at least a month before my ex visited me and plugged it into the right place (scoffing at how inept I was). I have my old boss speakers from the 80’s. No, not Bose or Voss, I mean boss as in cool, retro. They are big heavy speakers. I’m still in awe that I can have this theatre in my own living room. So back to my new X-box. I will get it plugged in and working. I will just plug it into the right hole. Then, no matter how bad the snow is blowing, I can dance or play games or fly an airplane or whatever! I would love to try the Wipeout game, jumping on big blue balls and sliding off into….. I don’t even know! I’m not really interested in stealing cars or shooting people so I’m curious if they have games for people like me; like have a shopping cart and knock off people at Walmart. I know I would like Dance Fever and Wipeout. But you don’t use the little hand device for that so…… gosh, maybe I want a Wii. I don’t even know! Forget it Santa; Ellen is my best hope. Today I would like to pass on an article from the Huffington Post on Pope Francis. I’m not catholic nor do I subscribe to any religion but I think he is a breath of fresh air. The lowly and simple marshmallow; that is a temptation I simply cannot say no to. And why would anyone? Well, I’m a vegetarian. Not vegan, I eat dairy products but I haven’t had meat or eggs for over thirty years. Marshmallows have gelatin in them. That’s really splitting hairs, I know, but I can’t help being aware that there are cow knees boiled up and squeezed into a goo that makes delicious candies and desserts. Vegans would say I’m a hypocrite for eating dairy but not gelatin. A slacker. Well, I say people are going to eat whatever they want to eat so let them and shut up. So I did not buy any marshmallows for many years and wondered what I would do if faced with a roasting marshmallow by a campfire and having the munchies to boot. And the most amazing thing is that for at least 20 years, maybe 25, everytime I was at a camp fire someone would say, “We forgot the marshmallows!” Sometimes everyone would not think of it until they got there. Sometimes someone would say “I even bought them and left them at home!” I would nod silently because I knew it was divine intervention….. 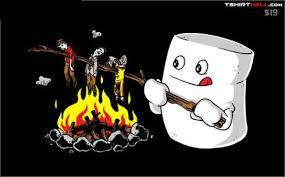 I was not to eat marshmallows. I live in a strip of land between Kettle and Stony Point First Nations and know a family that does drumming so a couple of years ago I asked for a session at my home. I invited my neighbours and family and we sat around a campfire listening to the drumming and singing. It takes you to another place. Afterwards my nephew pulled out a big bag of marshmallows. The kids found the perfect sticks and started roasting. I watched them take that golden brown crust filled with delicious goo and relish the flavour. I had to have one. I didn’t like the thought of ‘slipping up’ after all these years and yet I was with first nations peoples who respected the animals they killed and never took too much. Somewhere there’s a really good excuse in there, I thought. 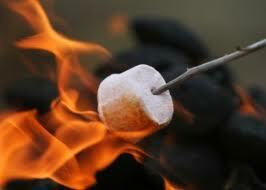 So I did it; I had a roasted marshmallow. In fact, I had two. But afterwards I had a slick ring of sweetness around my lips and felt the gluttonous guilt deep within. My nephew left the marshmallows here. Once, last winter I got the munchies real bad and roasted a couple in my woodstove. The same sickly sweetness, the same lonely shame. There are a few left in my cupboard, hard and yellow, but still good. Just in case I succumb to temptation again. Daily Prompt; I have confidence in me! I have so much confidence in myself it’s getting to be an issue. I’ve had to tell two friends recently to “please stop telling me what I should do”. I get so very tired of people telling me what I should do. I mean everything; working, dressing, the way I keep my home and garden, my singleness, my past, my future……. Oh god, people ….. please, stop!! I’m freaking 61 years old! I’m mature! I know I’m female, I know I’m fairly small….. but I’m man-sized inside! I honestly believe that size and gender have a lot do with it. I read an article about how we respond to people subconsciously; we will take authority from a tall person, especially if they are male, whether they are smart or not. I know a few tall males who are not more together than me and yet I will bet no one tells them what they should do. Everyone just assumes they have it all together. Everyone assumes I’m ‘struggling on my own’. I’ll admit I was a wimp in my youth. I was raised to not question authority (anyone older and male) and always be nice. Just go along and be nice. I would let people tell me what to do because I never learned to stand up for myself. I didn’t know how. Then I married someone who loved to tell me what to do and I did it, just to ‘keep the peace’. But over the years I discovered; no one knows any better than me. A lot of people get a power rush out of getting people like me to do things. I didn’t believe in my own power. If there is one thing I’ve learned for sure is to trust my own judgement. Over the years I’ve heard myself say “why didn’t I just listen to myself” so many times I started to catch on. I’m competent. Two things changed me; caving and public speaking. My husband got into caving first; I had no interest in going underground. But I was persuaded to do a beginner’s trip in West Virginia and was hooked! It was fun and just enough challenge to feel confident I could do it…. not only that but excel at it. Being small and strong is the best for caving. Over the years, I had to do more and more to keep up the thrills and so learned the rope work. This all added to my confidence in a big way. After every cave trip I would think, “I did that!” and feel so damn good. I was competent! The other was public speaking; I’m on a path that isn’t advertised or well known so I won’t get into what it’s all about (this time), I’ll just say it’s religious philosophy of the eastern sort. I used to be a speaker and would give talks about it in cities around southern Ontario. Anyone who has done public speaking knows how long it takes to write a half hour of talking. I really loved the writing and finding quotes in all the sacred books to back me up. It was getting up in front of people that was terrifying. I made sure I had every word written down otherwise my mind would be blank when I got up there. The first time I just read it very fast; profusely sweating. Everyone said ” very good but slow down!”. 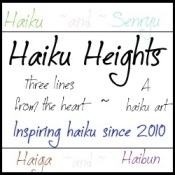 Eventually I became confident enough to look up and around and even ad lib. People would come up to me afterward and tell me how much they enjoyed it. This just fed my confidence…. I was competent! Now I don’t cave or ‘speak’. These are now gone from my life but they certainly served me well. They made me the whole person I am today. Facing your fears and conquering them instills great confidence! Witless is just a polite rhyme of how scared I was that day at Ellison’s Cave in Georgia. 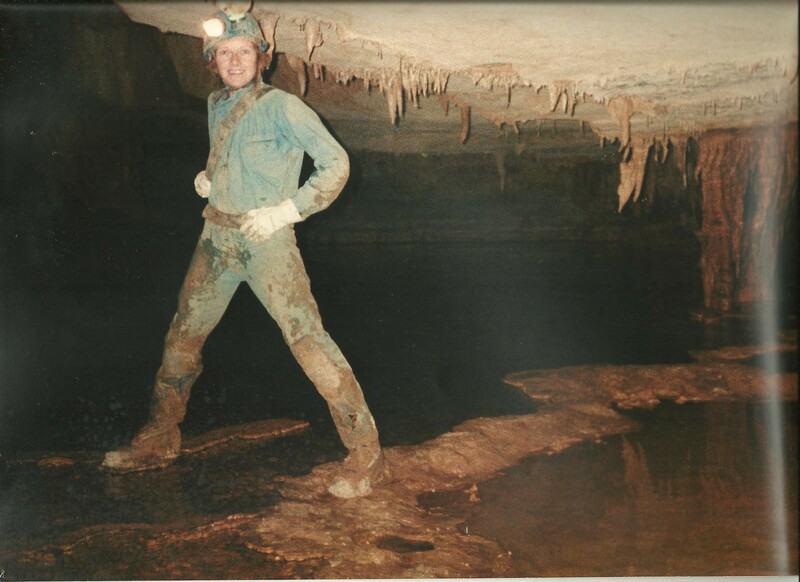 I had been caving for a few years; mostly in West Virginia, Tennessee and Alabama and was just learning the ropes (caving pun). But that year I was turning 40 and wanted to do something memorable. The big time cavers talked about Ellison’s cave. The drop is straight down 586 ft./179 metres, or about 18 stories. There are no walls to repel from, you have to manoeuvre over a difficult lip and be ready for a long dark drop. Being ready means going slow and not letting yourself zip down too fast. Loosing control of your speed is difficult to stop and can lead to death. 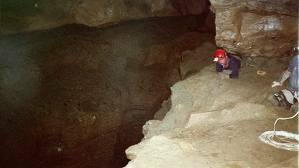 Ellison’s a major achievement in the caving world. So I worked out everyday with videos on my VCR and repelled on the weekends to prepare myself for this trip… this cave…. this drop. Beautiful photo from National Geographic, so that’s what it looks like all lit up. When you are dropping down it is pitch black. All you can see is the dull light from your helmet on the cave wall as you spiral slowly down. You search into the abyss for the pinpricks of light from your fellow cavers watching for you; resisting the temptation to go faster out of fear. But that wasn’t the scariest part. The scariest part I didn’t even hear about until I got there. The long repel was scary but not as scary as getting there. The first repel into the cave must have been fairly easy because I don’t even remember it. You had to do some difficult caving before you got to the big drop. But it’s just before the big drop that freaked me out. Now it’s scary enough already but I also have a cave bag with my climbing equipment in it. No turning back now. I reminded myself I was very small compared to most cavers that did this. I got on my belly, cave pack on my side, hugged that wall and started to crawl just like a snake. My face was almost kissing the wall and ledge; I could feel that long, dark drop tickling my back. I was so freaking scared! It was a curve you could not see around so you just prayed you didn’t run out of ledge. Finally the ledge opens up to a place where we could all rest and wait for the big repel. The scariest part of the repel was getting on the rope and leaving that ledge to dangle into the abyss. But it was exhilarating scary, not unsafe, scary. I trusted our equipment. I trusted my fellow cavers to make sure the ropes where good and our equipment was all in working order. I trusted my own abilities because I had practised and worked out in preparation. So it was scary but not unsafe. It was that little unmentioned move minutes before…. no ropes, no friends hanging onto me and FEAR. That was unsafe! Sometimes in bed I think of it and am so happy to be in my warm, safe bed. I hope I never feel that unsafe again. Times like that really makes me appreciate the security I have now. Daily Prompt; does evil exist, or is it all in our minds? That’s a loaded prompt. Sure to bring out all the religious crazies ready to spout their beliefs and fight for them! Like myself for instance. My beliefs are so strong I can be pretty dogmatic so I don’t talk about it unless asked. Is evil a real thing that exists apart from us? I don’t think so. The most evil thing that exists is human. The worst atrocities we can imagine are done by humans and many in the name of God. Some would say that Satan or evil provokes a person to do something, that in their weakness they let evil into hearts. 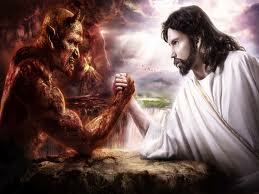 Satan would be the personification of evil as opposed to God who then must be assumed to be the personification of good. 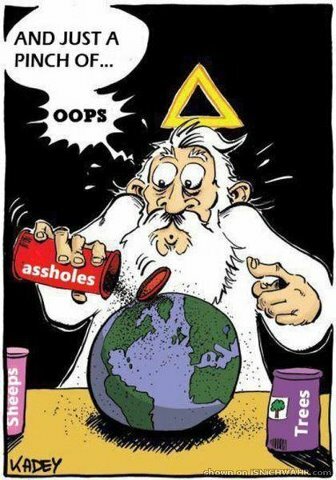 That’s where it all goes wrong for me. I don’t believe in Satan just as I don’t believe God is a Being separate from ourselves. The idea of God as some benevolent old man up in the clouds pointing a finger down in judgement is a concept for children for most educated people. And yet, when you say you believe in God, a lot of people take it back to this concept. Then seeing what evil is done in the world, in the name of religion, they toss out God along with religion. They throw out the baby with the bathwater. But does that mean we can’t believe in God….or in goodness anymore? I once started a discussion with someone who asked, “How can you believe in God but not in Satan? If there is God there has to be Satan!” It more or less ended there. I’ve been thinking about how to answer that question for 20 odd years. Generally we think something is good if we want it and bad if we don’t want it. What’s good for some will be bad for others. Do the ‘goodest’ ones get their prayers answered? Are we punished for our evil ways? My life experience has taught me a resounding “NO!” Life just isn’t fair. We need the polarity of duality to keep the universe moving. As in the image of the Tao symbol; there is black and white but each contain the seed of the other. Those seeds grow and the spiraling begins. We are living this motion. To disagree with Einstein; Not only does God play dice with the universe….. the dice are still rolling. But does evil exist? Just like good, it’s all in our minds. It’s free will. It’s our choice. Then go back to five. This really hit home; I need a decent job and yet dread having to drive out in the winter. The fear of success as opposed to the security of the daily routine. And missing someone who is not good for you. These are demons so many of us grapple with. The day after I may or may not have broken up with boyfriend, my old professor emailed me. She asked if I’d be interested in a job teaching a lit course to nurses and social workers. It would be at 8am in the middle of winter, where ice is slick and thick, where darkness stretches on for hours. I’m 71 years old and still live in my house. Every day I wake up and think, ‘here we go again’. I make my coffee, check Facebook to see if anyone died and who’s still living in their house. Then I work on my daily blog about what bugs me the most. I don’t read anyone else’s blog anymore because I don’t care. In the spring and fall I can walk on the beach any day I want. Never go there in July or August….. it’s mob scene. And they all pee in the lake.